The trial of city socialite Brian Kirumira aka Brian White has for the second time failed to kick off, following failure to trace the police case file. When the case came up for hearing Monday March 6, State prosecutor Happiness Ainebyona informed court that she did not have the police file in court. Court presided over by Makindye Court chief magistrate Elias Kakooza was informed that the Investigating officer had taken Brian White’s police file for purposes of settling the matter out of court and had not yet returned it. Without the file, Ms Ainebyona said she was unable to know the developments on the settlement. She thus asked court for more time to consult with the Director of Public Prosecution on whether to discontinue the case. The case has been adjourned to April 9, 2018. 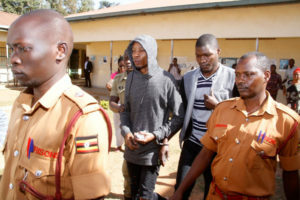 Brian White and his body guard CPL Thomas Okoth, attached to the police’s Crime Intelligence headquarters are accused of having shot Victor Bitwire on the night of December 13, 2018 at Brian White’s residence in Buziga, Munyonyo in Kampala.